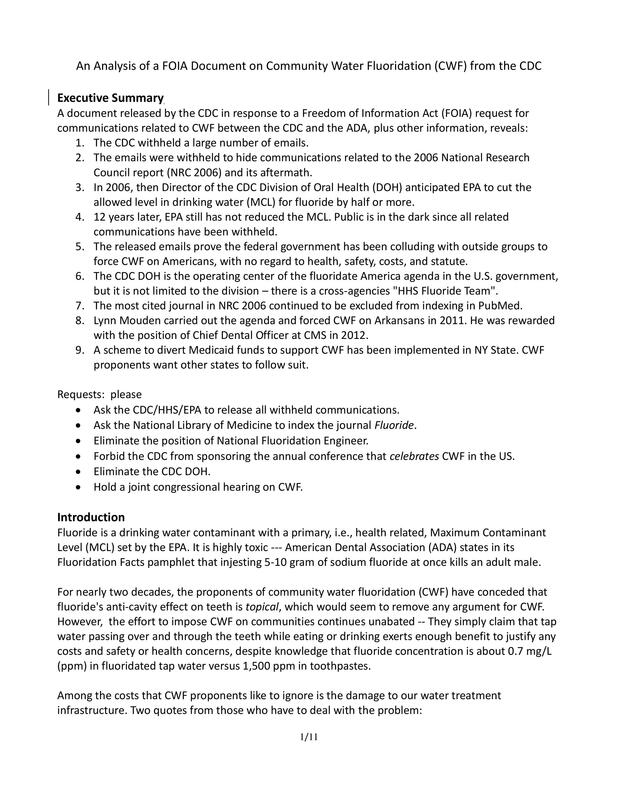 We DO need your help to bring more awareness to others and to follow up with our Congressional/Federal Delegation about the outright collusions between the Centers for Disease Control (CDC) (and other federal agencies) and outside groups to impose the dangerous community water fluoridation (CWF) on the American people. In the tunnel fire in Baltimore this summer, what chemical was feared most? "The most dangerous of the train’s load of chemicals, according to experts, is fluorosilicic acid." Unlike chlorine, fluorosilicic acid is odorless and tasteless. Numerous incidents have occurred where pumps have failed and many people have become ill and have died. There is a frightening parallel between the availability of planes to hijackers and the ready availability of highly toxic chemicals at water treatment plants. Tom Curtis of the American Water Works Association was quoted in the Times story as saying: "We don’t need to advertise where the weakest links in the armor are." Maybe the terrorists already know. ACTION ALERT: We strongly encourage you to read the eye-opening document below. After you do, again, we need your help in contacting both our U.S. Senators and all 4 of our U.S. Congressmen by email, phone, and fax to be sure they have the alarming and important information from this document! We have included their contact information at the very bottom of this alert (below the document), and it’s important that you keep it because they DO NOT publish it all together in one place, the way we’ve entered it. MCL – The Maximum Contaminant Level is the maximum concentration of a chemical that is allowed in public drinking water systems.